That indeed doesn't look good. Noted this, and we'll fix this with the next update. This is the best feature about the pockethernet that you can send reports directly but the formatting issue has bummed me out as I cant send a report like that to someone as it doesnt look ok. It also effects the APP too. If the information is larger than the box, you cant see it. Just a note, several app updates have come and gone, now on V26 and this is still an issue. 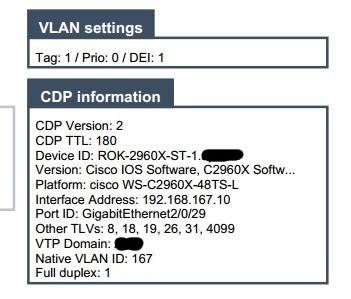 Not sure if DHCP info still crosses over into the CDP info pane, as DHCP also isn't working at the moment, but the CDP info still prints off the side of the page. Hi. Will be fixed as well with the upcoming app updates as well. I think we should have everything online and in the appstore by tomorrow afternoon. Updating the app should solve this issue. The apps are submitted to the stores and should become available in the store next 24 hours. Ok so it appears you 'fixed' this issue by just truncating the data? Instead of printing off the page it just ends with ... That's not exactly a fix now is it? I now have a report that gives my cisco version data as: Cisco IOS Software, C2960X Softw... And in the app itself it's filling out the remaining data on lines underneath the bottom of the visible box. I can't tap on it to see more or scroll down in the box etc. Ok managed to figure out how to get DHCP results as well, so here's how it looks with DHCP data when there are multiple DNS servers. The report formating issue is still there in latest version (updated 14.06.2017) when there are more than 3 DNS servers on the network. I have 7 DNS servers in the network and in that case the full page width is used overwiting the CDP/LLDP box. Would be great if this formationg issue could be fixed soon.